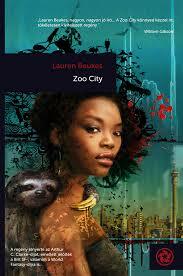 Zoo City by Lauren Beukes is set in a world where those who commit crimes gain animal companions and psychic powers. It’s not considered a good thing and those with animals sink to the bottom of the pile, making a living however they can. Former music journalist, murderer and junkie, Zinzi December finds things that are lost, for a fee. After a job goes south, she’s offered an opportunity to make a lot of money finding a missing girl. It’s not what she normally does, but the money’s too good to pass up. Naturally, nothing is as simple as it seems, and when she finds the girl she uncovers a much bigger, nastier crime. This is brilliant. It’s written in the first person present tense and Zinzi’s voice is compelling and funny. The plot is deep and tightly woven. It all makes sense at the end, and everything you need to know was always right there, masquerading as worldbuilding. I loved the concept of the animals and the powers and I loved the dystopian alternate world. I would highly recommend it.